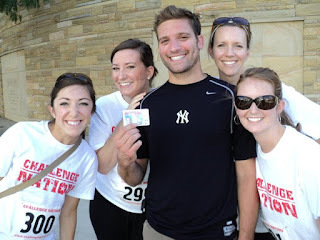 Part two of my extremely adventurous weekend – Sunday afternoon, I was in a scavenger hunt! My friends Erin, Katie and Mary Byrne and I rallied together to comprise Team Awesome, aka the best team in town. We were fierce, we were fast, we kicked everyone’s tail! None of us were really sure what to expect from this race. 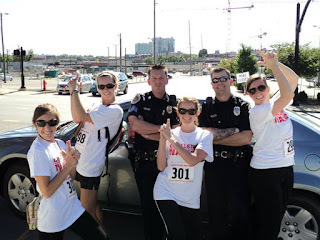 We met up Sunday afternoon, changed into our official shirts and then started strategizing. Upon getting our clue sheet, our plan was to split up reading/digesting the clues evenly and whomever figured one out first take off. We would do the rest of our planning en route. 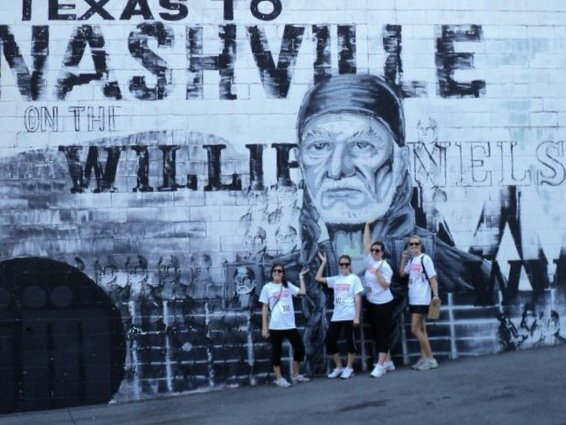 I pinned down a clue for us to head to first and we were on the move toward the Willie Nelson mural on Almond Street (“At the intersection of a street named for a nut that gives candy joy and a street that shares a last name with two non-presidents on our greenbacks, you’ll find a mural of this noted 77-year-old Texan – take a photo with him!”) We were off and before we knew it, we had four clues down, seven to go. While en route to Willie, we checked off the clues that asked us to find someone wearing a Vince Young jersey (“Hope they started the season off right! 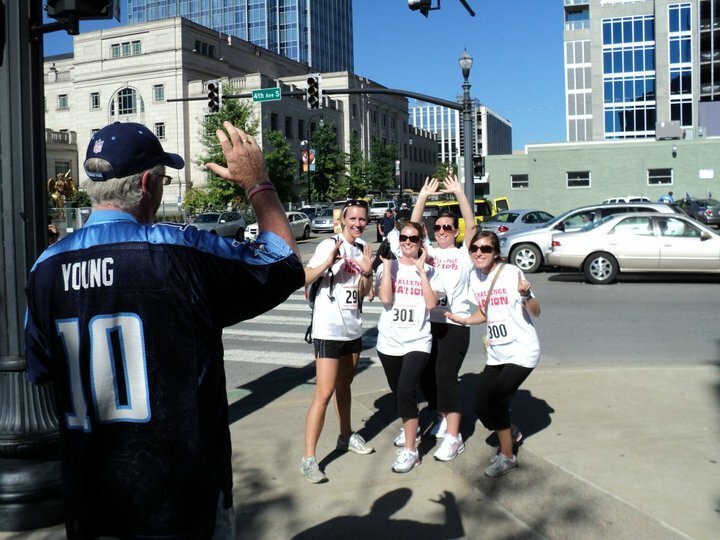 Find a Titans fan wearing this Madison High School graduate’s jersey. 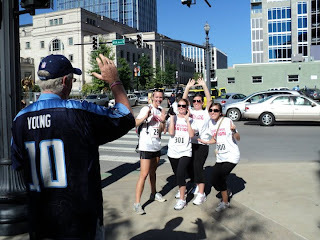 Have them mime a perfect spiral pass to your team catching it while one of your members indicates how many passing TDs the Titans had today!”); find a visitor from a state that started with the letter N and pose Charlie’s Angels style with a policeman. Lucky for us, the guy with the man in Vince Young’s jersey happened to be from New Jersey, and there were cops directing traffic a block over. Score! For our fifth stop, we had to hit up My Least Favorite Bridge in the History of All Bridges. “This bridge was almost demolished in 1990, but made a pretty big comeback with the entirety of the video for Save a Horse, Ride a Cowboy filmed on its span. 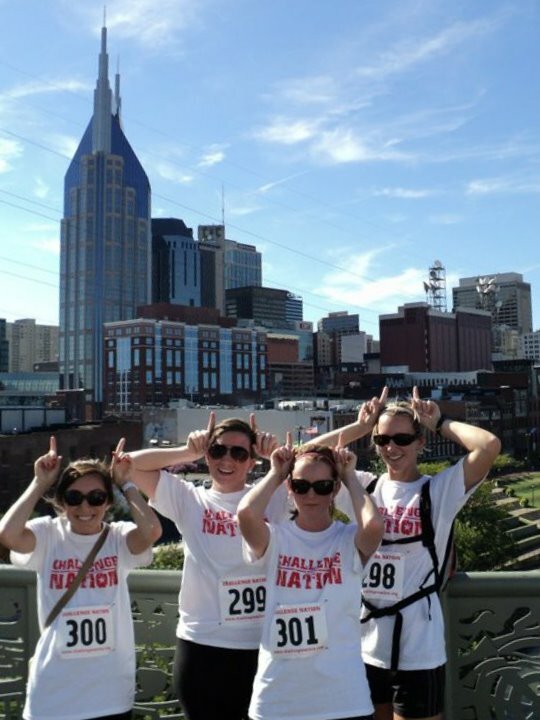 Take your picture on one of the balconies between its trestles with the Nashville skyline in the background – have your team mimic the tallest and most famous element of the skyline.” So we had to pose like Batman on the bridge. 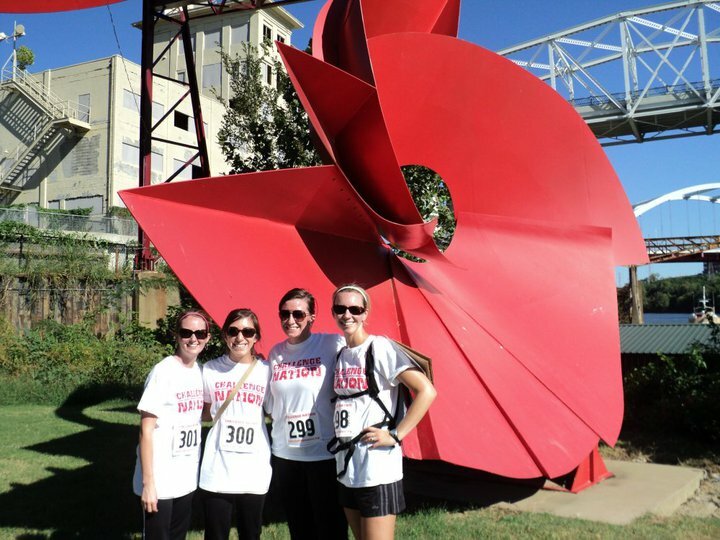 From there, we planned to run down to the tacky sculpture and pose with “the bit that looks most like a rose petal” –a decision that cost us the race. Let me explain. We had to complete 11 of 12 clues, which meant we could pick one to skip. We were just trying to check them off as fast as possible and figured there’d be at least one we didn’t know and would therefore elect to skip. BUT the problem with crossing the bridge is that you have to RECROSS it. Which takes some time. Only a fool can run the whole way so you are dedicating some serious minutes to getting back on the other side of the river. But, we didn’t figure that out until we were back at Paradise Park throwing back some beer and tater tots. 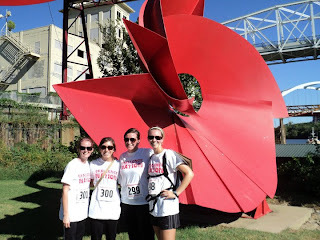 Instead, we ran the length of the bridge and down to the riverfront, got our picture with the sculpture and headed up the river bank to the other bridge, so we could end up near the government buildings close to where the we had figured the remaining clues were. 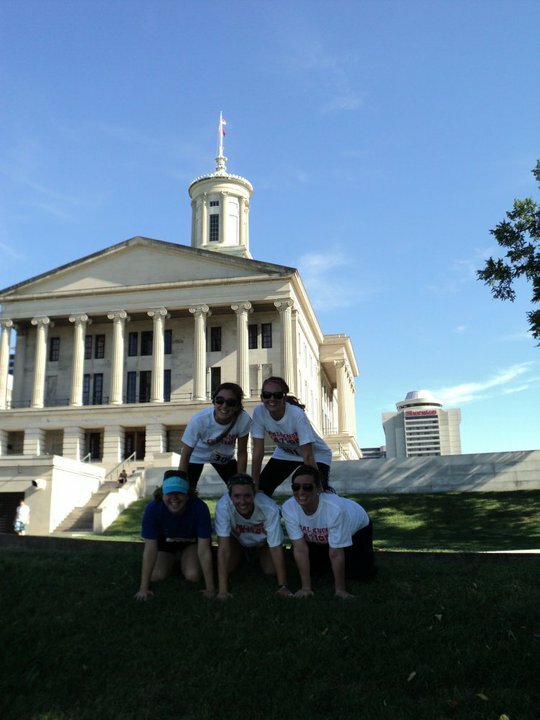 We piled on top of each other in front of the Capitol (“make a human pyramid using at least one stranger on the rolling hills in front of this prominent structure, which also serves as the its architect’s tomb. 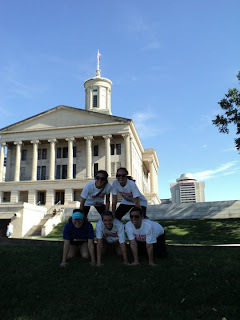 Make sure you capture the flag on the building’s spire in the photo!”); found the limestone columns that used to be in the State Capitol and contemplated checking off the clue that would have taken us down the hill to State Map plaza, but figured that could be our skipped clue. We had three to go! We raced to Fort Nashborough (“This reconstructed stockade miraculously avoided the floods this year—but the waters came within a few feet. 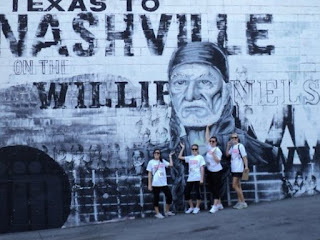 Find the cabin with the spinning wheel and take a photo in its doorway”) and then took off toward the Ryman (“Find a building, monument or object that’s just half as old as this crazy town and take a picture with it;”) and then we had one clue left. 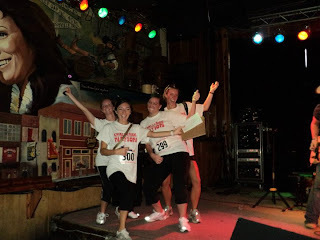 We had to jump on any stage at any bar and pretend to be rockstars. I SPRINTED to the Stage. We ran right inside and tossed off our team camera to a bar patron who is probably still scratching his head wondering what was going on. No one stopped us from jumping on stage and hitting our pose, and once we got our final clue in the books, we had to cross one street and we were done. I barely looked both ways before completely jaywalking (jayrunning?) 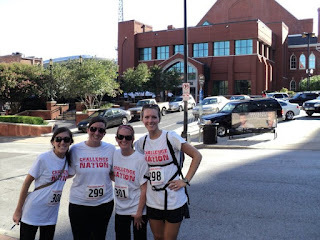 across Broadway and into Paradise Park, where we learned we finished in FOURTH place out of 80+ teams. Pretty good right? Except that first, second and third place got cash prizes. We were 5 minutes off. Oh well. I managed to parlay that into some free tater tots, which we enjoyed while we recapped the race and laughed at what we just accomplished. All in all – I had a blast. I am sore today but I’d do this event again in a minute. 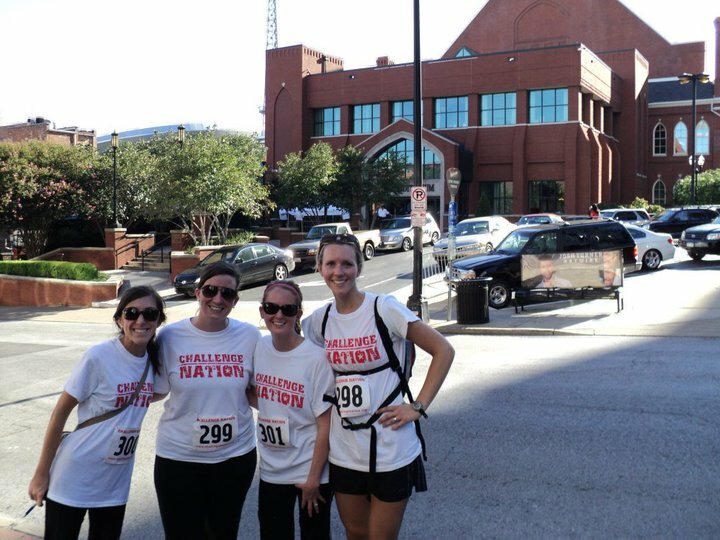 I had a great team, we all kept up with each other pretty well and having a really fast iPhone on the team proved incredibly beneficial (thanks Erin!) 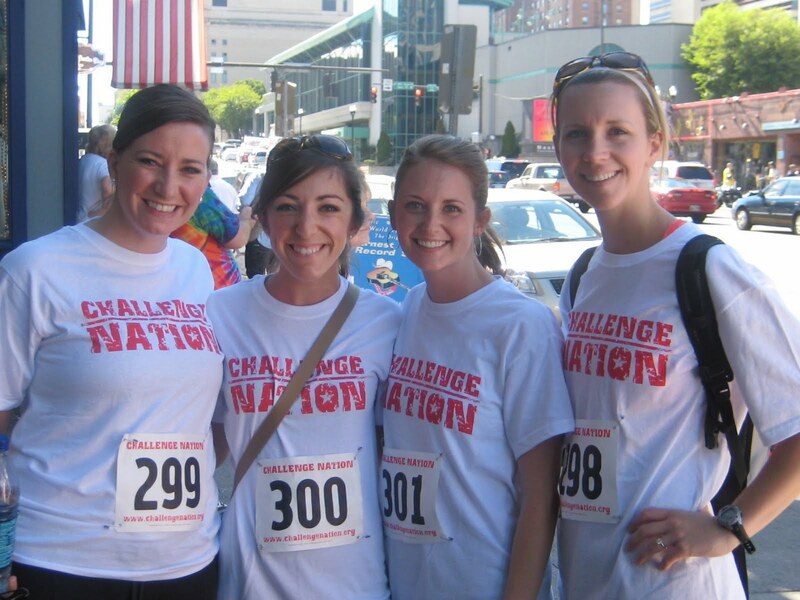 If the Challenge is coming to your city and you can run/walk 3—4 miles, I recommend you sign up! Here is our path, give or take. I circled in red the stretch we should have avoided. 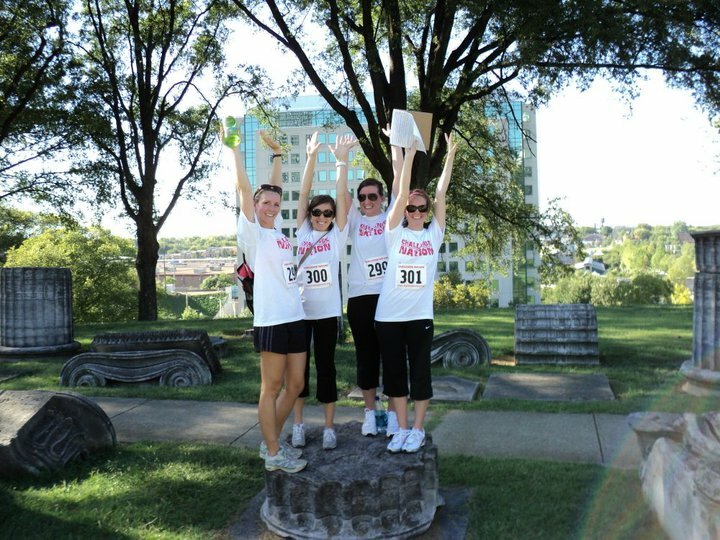 Our official time was 68:44! I'm SO impressed. 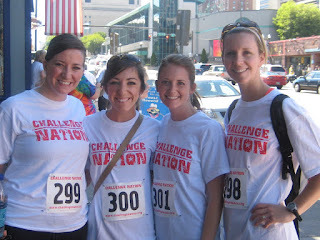 Congrats to a strong finish, ladies!